Joe Perry Aerosmith guitarist passes out during concert with Hollywood Vampires. Another rocker has hit the ground in the middle of a concert. This time it was Aerosmith guitarist Joe Perry who collapsed on stage on Sunday night in New York, while performing alongside Hollywood actor Johnny Depp and rock legend Alice Cooper. Fans in the Amphitheater were shocked as they watched the 65 year old guitar icon stagger off the stage at around 9:40 p.m. during a show with his second band the Hollywood Vampires. The band which had been touring for the last few weeks is made up of Perry, Johnny Depp and Alice Cooper. NBC News emergency services reported that an ambulance rushed Perry to the hospital soon after he collapsed. The moment he walked off stage was caught on camera by fans in the audience. 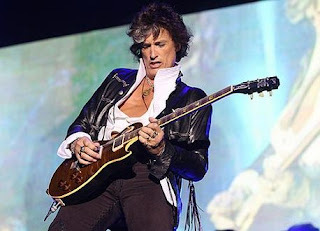 "he sat down before "passing out" off stage: " Joe Perry collapsed on stage just now! He had to sit on drum kit and then went behind a small wall and passed out. FDNY and NYPD carried him off quickly." TMZ confirmed that the guitarist had suffered a cardiac arrest. Alice Cooper has stated that he is in stable condition and under the best care.